GolfGreens is the ultimate synthetic turf to improve your short game, for the committed golfer to the recreational player. 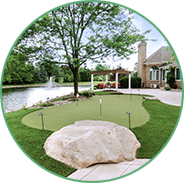 We create custom golf greens to make your home or business the premier practice and entertainment destination. Start thinking less about reading the line and more about speed. Maintain a light grip on the club and soft hands to maximize your swing. Keep your stroke simple, it’s a mini-version of your full swing. GET MORE CREATIVITY AND VERSATILITY IN YOUR OWN BACKYARD OR BUSINESS WITH GOLFGREENS. WE’VE INSTALLED MILLIONS OF SQUARE FEET ACROSS THE COUNTRY FOR PERSONAL RESIDENCES, HOTELS, RESORTS, RETIREMENT COMMUNITIES, AND MORE. 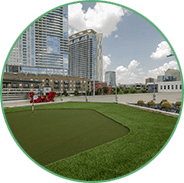 Like professional greens that are cultivated frequently, our artificial grass produces a firm, smooth, and well-drained surface, making GolfGreens the superior turf choice. You’ll enjoy a durably constructed product with unparalleled quality and playability. and your game with Golfgreens. left-arrow Created with Sketch. PUTT TO NEXT HOLE right-arrow Created with Sketch. golfball Created with Sketch. FOLLOW US	facebook Created with Sketch. twitter Created with Sketch. linkedin Created with Sketch. pinterest Created with Sketch. flicker Created with Sketch. youtube Created with Sketch.